Just prior to slamming the extruder into my heated build platform (HBP), I was going to print a razor holder that would hang on the side of the wire baskets in the shower. However, after that horrible (at least mentally) event, I switched to something smaller (the shelf clip) so as to not waste plastic. The wait paid off. After leaving yesterday with a serious case of “grinding noises” and small bits of plastic filament in the extruder gear, I was anxious to return to the studio today after work and do a check-up on my Thing-o-Matic. I naturally worry that I destroyed it already; nothing new, it’s my way to worry incessantly and imagine things at their extreme. 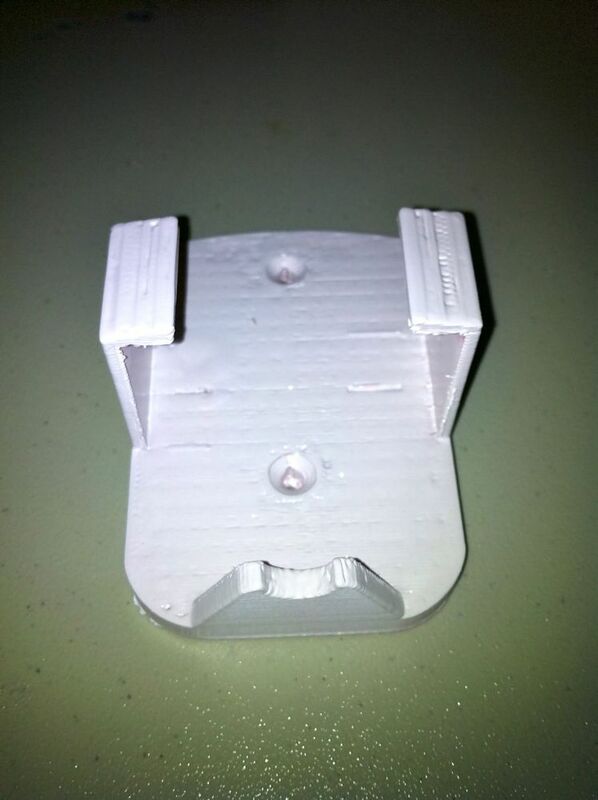 I discovered that the front lexan plate on the extruder head was incredibly loose! (In hindsight, I really should have done a more thorough check when I opened the box instead of a cursory one). A quick tightening of all of the bolts, some mouth-air blown into the top to expel little plastic bits, a good oiling of all of the axis rods, and a cleaning of the kapton tape and all is good. A test extrusion worked without a hitch and we should be good to go for the next print (which sadly probably won’t be until next weekend due to a busy week ahead at work). At least I can sleep tonight. 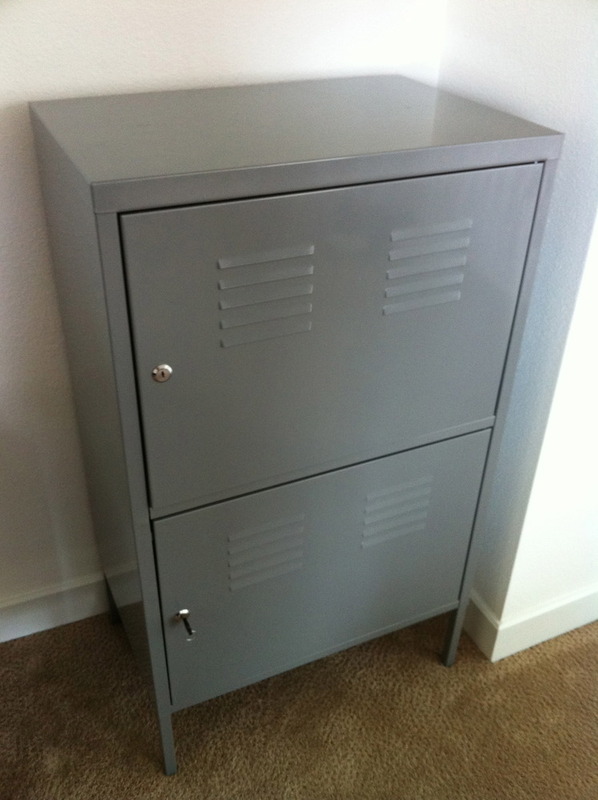 So we have these metal “lockers” we got from IKEA that we use as media storage. When we moved recently, the movers lost one of the little clips in one of the units and that meant we couldn’t use the shelf inside. As I was thinking about small things to fix around the house, I remembered we were missing this clip and figured it would be a good experiment since A) it was smaller and thinner than anything else I’ve printed, and B) it had a challenging shape — it was curved and had a narrower section that would have to be an overhang. So once I started printing things, my sci-fi loving wife’s eyes sparkled (more than normal) and she had a “we can replace every plastic piece in the house with something custom” moment. What I love about her is this was immediately followed by “you could drive someone mad with real subtle changes, too”. Yes. Indeed. Well, it was bound to happen, and on only the third day of printing I slammed the extruder head into the hot build plate! CRAP! Had to re-calibrate and all seems fine. Whew. On the plus side, I get really good “rafts” now (a plastic layer that allows for support structures to be built and in the end peels off the back of the print). Was going to print two things today, but am only going to have time to do one: a robot bee pendant loosely based on a design by my wife (see: opticwaste link over there on the right). The first one was a little too small, and the second is a little too big. The finishing step is her taking the plastic piece and applying a leafing process; she already had some copper leaf, so that is our test. It looks really cool. Will post pictures later. The second item was, ironically, a holder for a razor that would clip onto the wire-mesh baskets in the shower. Yup – Mundane Object Number 3. I will probably end up printing that tomorrow. My first two pieces that need to be assembled print. Yay. A first attempt at putting a “finish” on a printed piece. It was very hard with the sandpaper I had to get into the middle without breaking off the sides. It was interesting because the safety orange still shows through, even with six or so coats of spray paint; in hind-sight I should have used a plastic primer, not just plastic-specific spray paint. In the end, it’s white-ish, and replaces the broken one very nicely.